External RAID storage shared by 2 server, with the same/different OS. Each Server is using individual data channel to access individual RAID/Volume set, so that no data conflict or corruptions. 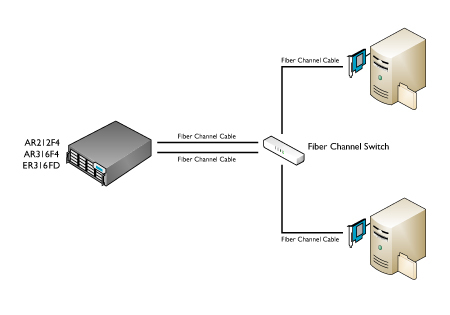 Performance up 4Gbps for Fibre Channel. Storage sizes with up to 9TB for 2U model and 12TB for 3U model. Supported RAID 0, 1, 1+0, 3, 5 and 6. Note: Each Server equipped with Single Channel SCSI/Fibre Channel Host Bus Adapter Controllers.